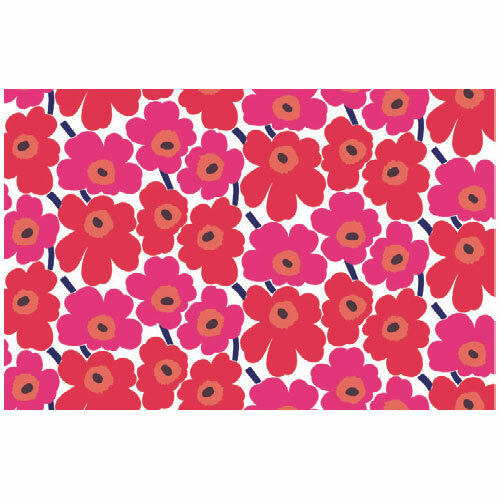 More about Marimekko Pieni Unikko Red Cotton Fabric One of Marimekko's most iconic patterns, Maija Isola designed Unikko in 1964. 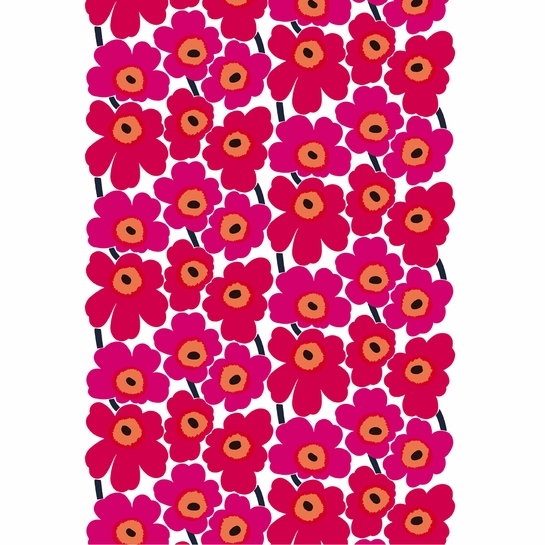 In the signature red colorway, but on a Pieni (small) scale, the Marimekko Pieni Unikko Red Cotton Fabric is just right for summer frocks or year-round drapes. Want to get a glimpse into the world of how amazing Marimekko Fabrics are made? Click the link below to view a short video clip. Classic MCM - never goes out of style! I have used this design to deliberately patch my torn jeans alongside the Marimekko Pieni Unikko Blue Fabric. What a difference this makes. I receive really great complements everywhere I go, people ask where did I get those jeans? I'd like to make a summer dress with this fabric. Is it suitable for apparel applications or limited to upholstery/home applications? This cotton fabric is perfect for making dresses and clothing items. One of our employees has made many dresses from different Marimekko designs. What is the size of the flowers? I am wanting to make a window seat cushion out of the black/white Lokki fabric, And use the Pieni Unikko red fabric as the border. Would this cotton fabric hold up or do I need to use the upholstery fabric? Ii see you have the Pieni Unikko red fabric in upholstery material but not the black/white Lokki fabric. I also read in your descriptions that you suggested you could use these cotton fabric materials to make a bedspread, so I was wondering if you thought this would be suitable for a window seat?